Based on a novel by Yusuke Yamada, The Chasing World revolves around beleaguered high school student Tsubasa Sato (Takuya Ishida), who in the past few years has had to deal with the death of his mother, his father’s alcoholism and the hospitalisation of his catatonic sister Ai (Mitsuki Tanimura). One day during a fight with local bully Hiroshi and his gang, Tsubasa is mysteriously transported to an alternate universe in which everyone who shares his surname is being hunted in the name of sport. The week-long ‘Death Chase’ has been declared by the tyrant King of Japan, a masked figure with alleged supernatural abilities, and with the use of all vehicles and weapons outlawed all the remaining Sato’s can do is run. Essentially Battle Royale meets Run Lola Run, The Chasing World exemplifies everything that’s best and worst about Japanese filmmaking in the 21st century; the way-out premise, the undercurrent of paranoia, the low budget special effects, the heightened sense of reality, unashamed lashings of the supernatural. When it all comes together, as on Suicide Club, Big Man Japan or Blood: The Last Vampire it works beautifully. The Chasing World isn’t perhaps as widely renowned as some of these, but it is no less engrossing - an ambitious and enjoyable take on the dystopian genre that contains many moments of profound intensity. Director and screenwriter Issei Shibata works the hell out of both his source material and his actors in his efforts to keep the pace rocketing along and succeeds admirably, with the end result there’s never a dull moment to be had. The notion of parallel universes is an endlessly fascinating (if strictly hypothetical) concept, and is here dealt with in an intelligent and cogent fashion. 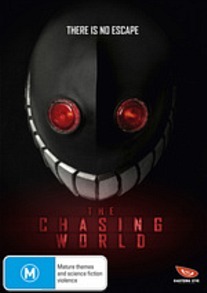 The Chasing World has taken a while to obtain a release on Australian shores – it appeared elsewhere on DVD in 2008 – and though it occasionally collapses under the weight of its own metaphysics the film winds up being an adrenaline-heavy Orwellian nightmare run through a distinctly Japanese filter. With a sequel courtesy of Shibata and Yamada already in the can, now is the perfect time to check out this underrated and cleverly concocted sci-fi gem. The 16:9 anamorphic widescreen transfer is surprisingly poor for a Madman release, amongst the worst we’ve ever seen in fact. There’s a lot of shimmer, blacks lack definition and occasionally bleed into one another and the transfer itself is quite grainy, more VHS than DVD quality, especially for a release evidently shot on HD. Still, the visuals themselves are strong and cinematographer Shin Hayasaka imbues each scene with plenty of drama and movement. On the audio front there’s nothing at all amiss: the Japanese DD 5.1 and Japanese DTS 5.1 soundtracks each mean business. On my surround setup at least the straight 5.1 was the way to go, with crisp dialogue and Kazuya Takase’s deftly emotive soundtrack really brought to the fore. Nada, just a theatrical trailer. Previous international DVD editions, which appeared under the title Real Onigokko, appear not to have contained anything much in the way of supplementary fare either. A Blu-ray edition of both films was released in Japan in late 2010 and reportedly contains numerous deleted scenes, featurettes and the like, but a local HD release seems unlikely to be forthcoming any time soon, especially since the DVD took three years to hit our shores.